- Pre-trip consultations and extensive information by e-mail or telephone about all the details (maps, weather conditions, fee entrances, etc.) 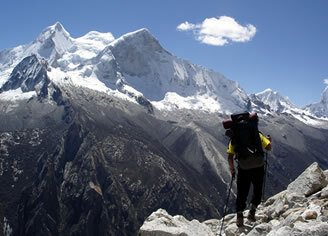 of your trek or climbing tours in the Cordillera Blanca. - Support of Porters, Cooks, Camp guards, Horsemen, Etc. - Pack animals (donkeys, horses, mules or llamas) to carry gear in this way only carry what you wish. - Non-personal trekking equipment: kitchen and dining tents, camping tables, stoves, etc. - Help with bus reservation, air bookings from Lima to Huaraz and viceversa. - Hotel reservations in Lima, Huaraz and/or other towns around the Cordillera Blanca. - We check your personal mountain equipment, before you leave for a trip. - We assist you with the purchase with the expedition's shopping, fee entrance to Huascaran National Park and other tourist places. - We organize the transportation to and from the villages (start and finish points of the trekking circuits or access points to climbing tours), we advise how to prepare the gear to be carried by mules.